According to Author Of, winning the New Voices Award empowered Tuck as writer. Prior to submitting As Fast As Words Could Fly to Lee & Low Books, she had attended her first Society of Children’s Book Writers & Illustrators (SCBWI) conference in June 2007. While delighted with all the helpful information from authors, editors, and agents, she left discouraged because she didn’t feel that she had the time to devote to writing that some of the speakers suggested. She hit a writing slump and didn’t write for a while. Once her husband persuaded her to write her dad’s story, which became As Fast As Words Could Fly, her hope began to revive. 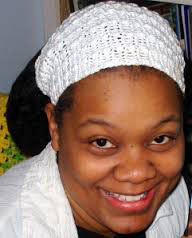 She submitted her manuscript to Lee & Low Books and in December 2007, she received a call from one of the editors announcing her as the winner of their New Voices Award. Her goal as a writer is “to enlighten and inspire my readers to believe in themselves, embrace diversity, and have the courage to make a positive difference.” You can read more about the lovely and talented Pamela Tuck in my interview. Please return tomorrow for a special guest post from her about how to write family memories. Then on Wednesday I’ll post my thoughts about As Fast As Words Could Fly. Save the dates: January 28-29! ALLISON: Did you grow up in a big or small family? What was your relationship like with your parents? Siblings? PAMELA: I grew up in a small nuclear family, but a large extended family. I was an only child, but the oldest grandchild out of 13. I came from a close-knit family, so we shared each other’s trials and triumphs, and supported one another in every way. ALLISON: Your grandfather was the storyteller in your family when you were growing up. What is the most happiest story he ever told? The saddest? PAMELA: Some of the happiest or funniest stories I remember my grandfather telling were his tales about Bruh Rabbit and all his adventures outwitting the other forest animals. I think the saddest stories I heard were the ones about slavery. ALLISON: Did other relatives share stories too? Talk about one of them. PAMELA: Oh, yes! I came from a family of storytellers, so it wasn’t uncommon for any member of our family to break out into a story. Even if it was just a retelling of the day’s events, they had an expressive finesse of sharing stories. One of my favorite stories is about my grandmother eloping with my grandfather because their fathers were enemies. She and her younger sister were forbidden to “keep company” with the Teel boys. My grandmother helped her younger sister elope, and then later planned her own “escape”. Because of a lack of money, my grandmother had to move in with her in-laws, my grandfather’s parents, who were less than thrilled to have her as part of the family. Her newlywed dreams turned into her worst nightmare as she began her married life as the despised daughter-in-law. This family story also found its way into a book. It became my YA novel, Color Struck. ALLISON: As Fast as Words Can Fly is based on one of your grandfather’s experiences with civil rights. How difficult is it to capture someone else’s story to paper? PAMELA: As Fast As Words Could Fly highlights my father’s journey of desegregating the public school system in Greenville, NC, after my grandfather filed a lawsuit for equal education. The hardest part of writing his story was trying to capture the emotional impact within a few pages. I struggled with “giving my father’s story justice”, but the one thing that made it easier was that the facts of the story were already there. I just had to find a creative way of connecting the events and picking which parts to highlight. ALLISON: What is your most memorable experience with prejudice? PAMELA: One experience that comes to mind is when my husband and I rented a house years ago. The house was handled by a realtor. After meeting us and seeing our spotless credit report, the realtor offered us the house. We signed the lease and paid the deposit. One evening, my husband and I wanted to take another look at the house, and we noticed that the landlord’s office light was on. So, we decided to introduce ourselves. The meeting was awkward. The landlord wasn’t rude, but he had a stiff courtesy that left my husband and I wondering if we had made a mistake by introducing ourselves. Shortly afterwards, we were told by our realtor’s assistant that the house was no longer for rent, although our deposit check had already been cashed. After a series of events, we eventually rented the house and over time, we were able to establish a very nice relationship with our landlords. ALLISON: In As Fast As Words Can Fly, Mason uses a typewriter. Have you used one? What is your primary tool for composing your stories? Paper or keyboard? Why? PAMELA: Yes, I’ve used a manual typewriter and found it very challenging. I admire any typist who chooses to use a manual typewriter for his/her compositions. I prefer a keyboard to compose my stories. For some strange reason, my ideas flow more rapidly as I type, rather than when I write. I’m not sure if it’s because I can type faster than I can write, which allows me to keep up with the pace of the “voice” giving me the story. The computer certainly serves as a better tool for rearranging my thoughts by cutting and pasting and inserting and deleting sentences. However, I still try to keep a journal handy just in case I get those fleeting wee-hour-in-the-morning thoughts that seem to vanish as soon as you get up to capture them. ALLISON: You and your husband often work together on projects. How do you handle differences? PAMELA: Working with my husband is such a joy. We respect each other for the contributions we make to our projects. My husband gives more of a character and plot development asset to our work. He helps me iron out those not-so-clear areas in my writing. However, we do disagree on some things: what a character will say, how they may say it, or what they will do. The way we normally handle this is very practical. We evaluate the sentence or event in question and determine whose idea really works better for the story. After an honest evaluation and some reasoning, we can usually reach a compromise by either using the best idea that complements the story, or incorporating both ideas into one sentence or event. ALLISON: You submitted your story to Lee & Low. How did you hear about them? What has been the highlight of working with them? PAMELA: I think my husband found out about Lee & Low in the Children’s Writers and Illustrator’s Market. He was researching different publishers and agents to see what each one was looking for. What I enjoy the most about working with Lee & Low is their compassionate interest in me and my work. I’ve learned so much about writing after working with my editors. Every aspect of the publication process has been extremely rewarding. Lee & Low has a mission to provide books for everyone and about everyone, and I can honestly say that the warm family-like feeling I’ve experienced as one of their authors certainly validates their aim of nurturing new talent. To me, their mission statement is not just a motto, it defines who they are. I’m honored to be a Lee & Low author, and claim them as a part of my “extended family”. ALLISON: When you talk at schools, what do you want students to learn about African-American history? PAMELA: I enjoy enlightening children with stories that expand their knowledge beyond what they’ve been exposed to. I’m thrilled to share my dad’s story as a part of African-American history, but my main focus is to encourage children to always strive to do their best and to believe in themselves. I hope that my story will demonstrate to children that they don’t have to do something big to do something great, and they don’t have to be famous to be recognized. ALLISON: You have also written a novel. Do you prefer picture books or fuller length books? Why? PAMELA: I prefer writing picture books. I think one reason is because I love sharing picture books with my children. They offer a quick peek into complex topics, foreign cultures, or just plain ole fun. Another reason is time. Fuller length books are more involved: character development, plot, subplots, etc. My story ideas usually come short and sweet, which tend to lean toward picture book quality. PAMELA: I have a few picture book projects in the works. Two that are historical fiction and one that’s just plain ole fun! I also have a middle-grade novel that I’ve had “resting” for a few years. It may be time to wake that one up and hopefully give it life.